Weaving a complementary human narrative from diverse threads of consciousness. En tissant un récit complémentaire humaine à partir des divers racines de la conscience. The Sustainable Development Corporation SDC, Indigene Community encourages individuals in society to engage each other, institutions, business, industry, government, education and organizations in dialogues flowing from our differing perspectives and knowledge essential to the whole. Our Indigenous ancestors worldwide maintained practices of formal dialogue or council by which members with differences and concerns over each others approaches could formally approach each other for 'dialectic' ('both-sides') exchange. This dialectic right enabled those with perceived differences to engage each other point-by-point. A culture of formal dialogue is necessary for social healing systematically from bottom to top. Fair hearing & dialogue are basic human rights in society for bringing about the conditions for collective intelligence. We need formal (devoted, timed & recorded) dialogue for research (scientific inquiry), conflict resolution (sorting-out difficulty) and for building relationship (structured collaboration). The word ‘debate’ derives from the French meaning ‘de’ = ‘undo’ + ‘bate’ = ‘the fight or battle’. Humans as one of many species for whom interpersonal and collective communication are a major part of existence; loving, collaboration, learning, growth and transformation through reciprocal flow of the spoken word and other forms of communication. When equal time is devoted by individuals for the purposes of 'dialogue' ('dia' = 'across' + 'legein' = 'to speak' and 'logos' = 'knowledge'), they are able to plan within this limited period to speak their priorities and make the best presentation of which they are able. This speaks to Mohandas Gandhi's 'Satyagraha' (Hindi = 'truth-search') programs of helping individuals to speak and then act upon their best intentions. Some professionals and institutional thinkers refer to 'mediation' as 'cloistering parties in a room until the issue is resolved'. This closed approach is one of professionals trying to take control of interpersonal processes. They are well meaning but leave out essential steps of human communication. There are quite a few schools of thought, but essentially what many in our institutional society know, 'There is something wrong with the professional system of government & corporations'. Hence many are trying to develop open systems where the public is part of resolution on their own terms. Most don't realize that these systems are very old in 'indigenous' (Latin = 'self-generating') heritage. These open approaches upset professionals who want control because they don't understand human psychology (Control Theory) and whole system design. Open equal-time recorded and published debates provide a method for people of all cultural backgrounds to express themselves on their own terms. There is opportunity for confidential deliberation mostly where the impacts are between two individuals, a family or limited circle of people and privacy can be protected. However brave individuals may understand that we all share similar human genetic codes and personalities, so if dialogues can be published, often a whole community, nation and world can benefit from their deliberation. Debates are essentially a Balance Sheet, where 'both-sides' ('dialect') present their perspectives side-by-side, point-by-point so the public as well as participants are able to make a comparative analysis of the different positions. What our institutional schools don't teach in 'academic' debating or law school is that finding complementary points is a powerful way for both sides to find a win-win resolution of concerns. Indigenous peoples being cultural and based in mutual aid, understand complementation. Balance Sheets are made possible when participants have control of their own process and terms. Typically mediators unfortunately come in with their own methods and agendas and underlying issues are not resolved causing the situation to repeat in coming years. Participants by recording equal-time dialogues and publishing in a series of debates transform public conception of issues. Dialectics are Socrates original concept in Athen's 'Garden of Academus' 2400 years ago as well as the foundation of what media is supposed to perform in communication for the people. Dialectic method is ancient from the times of indigenous (Latin = ‘self-generating’) peoples who encouraged debate within witness circles of family, friends & colleagues. In Longhouse, Pueblo and communities world-wide, speaking dialectically to the issues of community living was a pleasure. Socrates 469-399 BC (Athens) advocated debate as a foundation of civil life as well as essential to true 'education' (Latin = ‘to lead forth from within’). Ancient Greeks would record dialogues from memory to paper with water-clocks recording time used by each participant. Mohandas Gandhi as a lawyer reached out for the best intentions of his opponents and friends. In dialogue with British authorities he shows concern, “We think it is time that you recognized that you are masters in someone else's home. Despite the best intentions of the best of you, you must, in the nature of things, humiliate us to control us. General Dyer is but an extreme example of the principle... it is time you left”. Our common dialectic heritage led to modern court, justice, parliamentary, news media (print, radio and television), social service or counselling systems, which unfortunately have overstepped the civil foundation of debate in family, business and community as each of these have become beholding to centralized economies. As debate lessens in interpersonal relations, we become inarticulate in familiar day-to-day relations. We’re passive onlookers to expensive lawyers and detached (non-peer) judges summarily attempt to sort out a dearth of formal speaking practice. Today the words ‘debate’ and ‘dialogue’ are used without definition to include any kind of idle-banter between individuals who agree or disagree at any time. Imagine if family, students, workers, business leaders, suppliers, consumers, professors and other stakeholder or citizen roles had the right to formally challenge the family, business, institutional and governmental practices and policies they are involved in. ‘Formal’ process ensures that challenges are written and rigorous so as not to encumber organisations or individuals with unnecessary challenges. Individuals or groups first create a statement: Request for a Dialectic Hearing RDH with a couple of paragraphs in concern or complaint. Both Sides Now simplifies the rules of debate so that individuals can share their truths, perspectives & under-standings governed only by 1. Equal-time & 2. recording. An envelop of time such as 90 minutes is divided in two so each party has 1/2 such as 45 minutes to speak the priorities of their perspective. Each may respond point-by-point to the other’s assertions and/or speak their own. As human intelligence or concept are diverse, BSN only asks that time be respected and that an audio recording be made so that each party is responsible to the larger circle or community in which it may be shared or published. Participants come together within an agreed upon time-limit giving adequate time for exploring perspectives, disputes, research, alliances etc. The participants read their RDH & make an initial declaration or response at the beginning of the dialogue session and then speak freely as long or as short as necessary to state concerns. A facilitator provides a pencil and paper for participants to keep notes on concerns raised, turns the recorder on and off and as well watches over the time used. Some recorders have automatic shut-off when no sound is heard. Whenever someone is speaking, then they have their time-watch recording. When someone wants to interject a response or statement, then they will raise their hand. Participants may speak as long or as short as they feel is necessary for their point to be made. Discussion is not censored to any degree. Only the recording makes each participant responsible to a wider circle and to posterity. The facilitator may provide water or refreshments to the participants as well. Every time a participant speaks, time is recorded on their stopwatches until they have stated whatever they desire and cumulatively until their time quotient is used up. It’s to the advantage of each participant to speak in concise time-frames and to specific points that can be responded to by the other participant. Notepads help listeners to make notes about specific points needing response either specifically or generally. Dialogues are streamed according to each stakeholder group or citizens in natural groupings such as students, teachers, consumers, workers, suppliers or founders. An individual challenge is first reflected upon or among & then between citizen roles. Individuals first engage among their own affinity groups or levels. Organisational ‘point’ individuals (Presidents, General Managers, Secretaries etc.) who are managing resources at more central levels of business, institutions or government will expect that debate will be first streamed among groups or levels so as to create coherent group statements. Consensus or unity is thus developed in corporate or political affinity groupings. Once a person has engaged in debate at their citizen, consumer, worker, supplier or other role levels then they proceed on up the ladder to higher levels and finally a highest level if needed. Debate is a right at all levels from the individual to the international level of our collective existence. Much of our social ‘narrative’ or the ‘talk between us’, competitively assumes that only social or economic dominators ‘capture’ conversations or make decisions. Over thousands of years we’ve been colonialized to suppress others by controlling public policy through the record. Indigenous dialogue considers each verbal thread weaving complementary truths to make the human song of relationship. Talk is worth little if it isn’t true (‘in alignment with’) to our lives. We live and contribute to connected inter-dependent lives. Humans are social animals who live by giving and receiving in ‘community’ (Latin = ‘com’ = ‘together’ + ‘munus’ = ‘gift or service’) and complementing our gifts. Mutual-aid begins when multiple stake-holders are given the opportunity to express diverse viewpoints & invest contributions to whole-group-solutions through economies and groups that recognise and account. The opportunity to invest and develop ownership (stewardship) as stakeholders requires that we put forth our effort, time, resources and money. Welcoming each other to participate in collective economic livelihood together builds human relations. In civil dialogue it is often the most accommodating, purposeful and true to one’s word that will impress the most of us. Imagine if every conflict was given the opportunity for dialectic hearing. If nations, education, institutions and business required individuals & corporate bodies to engage, receive and publish hearings, then no one would fight to injure verbally or physically and no one would go to war. The published word is mightier than the sword. 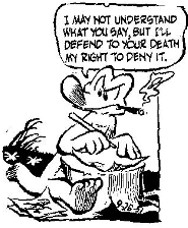 The following cartoon by Walt Kelly from his newspaper and book series called Pogo published 26th Septembre, 1951 quotes Albert Alligator, "I may not understand what you say but, I'll defend to your death, my right to deny it." captures some of the common dialogue found in present-day 'informal' exchanges or 'idle-banter'. Most are not leaving their silos to interact their worldviews, thoughts and feelings with 'others'. Kelly is paraphrasing a quotation from Francois-Marie Arouet de Voltaire 1694 - 1778, the French philosopher, "I may disagree with what you have to say but, I shall defend to the death, your right to say it." Participants sign a contract at the beginning stating if and what distribution or publication are acceptable. Disclosure statements will vary according to the needs of each individual or the groups they are associated with. A disclosure statement may be limited to only specific people or may include broad publishing targets. Some individuals maybe both will want various levels of confidentiality. Others may desire a witness to observe the talk as well as to monitor the process. In the public interest some may prefer public disclosure and even publishing of the audio, video, written or transcribed record in various media. There should be an agreement between parties before a dialogue specifying the degree of confidentiality or publishing desired. If the participants or their organisations are interested, transcribed written copies can be made in addition to the audio or Audio-Visual copies. These copies can then be circulated within each organisation, business, industry or institution for collective consideration. Digital recording devices such as DVD disks or ‘Voice-Recognition’ software help in the transcription process. Dialogues may be filmed (video), audio recorded and/or transcribed to written pages so as to share them with participants and then in larger circles. Listening or viewing a dialogue help participants better understand or become aware of communication styles and dynamics between them. Groups and individuals involved can each contribute to the expenses of creating a record. Participants and the facilitator are each given a copy. How is formal dialogue different from informal dialogue? When individuals meet in arranged-upon specific amounts of time devoted to an issue's dialogue, then they are committing themselves to engage with the other and explore a specific topic fully according to agreed upon processes. The word 'process' implies 'to go forward', a form of agreed upon structure or channel through which people can channel dialogue so as to achieve specific communication results or resolution. While some refer to any dialogue as 'debate' when two positions are entertained, committed dialogue allows the participants to devote a specific amount of time and make their presentation of facts and logic sequentially in the order that each feels is necessary. Informal dialogue can be considered uncommitted, unstructured 'idle banter'. When dialogues are not recorded, there is no record upon which to review and share what has been said between the two participants or among the communities which they represent. Judges in our existing centralized system are charged with implementing community and inter-personal dialogue or 'dialectic' (balanced two-sided) hearings in 'peer' (common economy) centered judiciary. The legal profession should be very careful for the elitist status they have unjustly appropriated. Peer related justice is ancient and founded in the concept of interactive community-based common-economy. From their wealthy secluded country, city & vacation homes to the elitist schools they themselves stand favored by or send their children or to privileged tourist junkets by plane, the abuse of wealth and power by the legal profession stands in direct contradiction to the dialectic positions and missions they are charged with. In addition to dialogue, the necessity for common economic action, gives law its 'bones' (structure). Law is as good as its pro-active system of economic implementation. Indigenous peoples around the world integrated participatory multi-stakeholder economic systems of accounting for contributions and investments in systems of progressive ownership and sharing of creation and essential goods and service benefits over the course of a lifetime. mid-12c., "the exercise of authority in vindication of right by assigning reward or punishment," from O.Fr. justise, from L. justitia "righteousness, equity," from justus "upright, just" (see just (adj.)). The O.Fr. word had widespread senses, including "uprightness, equity, vindication of right, court of justice, judge." The word began to be used in English c.1200 as a title for a judicial officer. Meaning "the administration of law" is from c.1300. Justice of the peace first attested early 14c. In the Mercian hymns, L. justitia is glossed by O.E. rehtwisnisse. The above Etymology-on-line is limited in that it assumes 'reward or punishment' (reactive) rather than a balanced system of proactive interaction. The perversion of the justice system stemming from our lack of inclusive common participatory economy is fairly complete in our society today, like a computer virus distorting the original design and programming for pecuniary self-only gain. The original dialectic means and end of justice are meant to be employed systematically at every level but particularly in our human roots of interpersonal, family, community and municipal levels then from this 'tree-root' foundation on to provincial, state, nation, continental, hemispheric and internationally levels. We need systematic solutions at every level for the whole of society not the privileged few. We can learn from our common indigenous heritage to understand balanced cultural systems and in contrast how to rectify this ongoing miscarriage of justice through deep tree-rooting in order to achieve sustainable human culture.